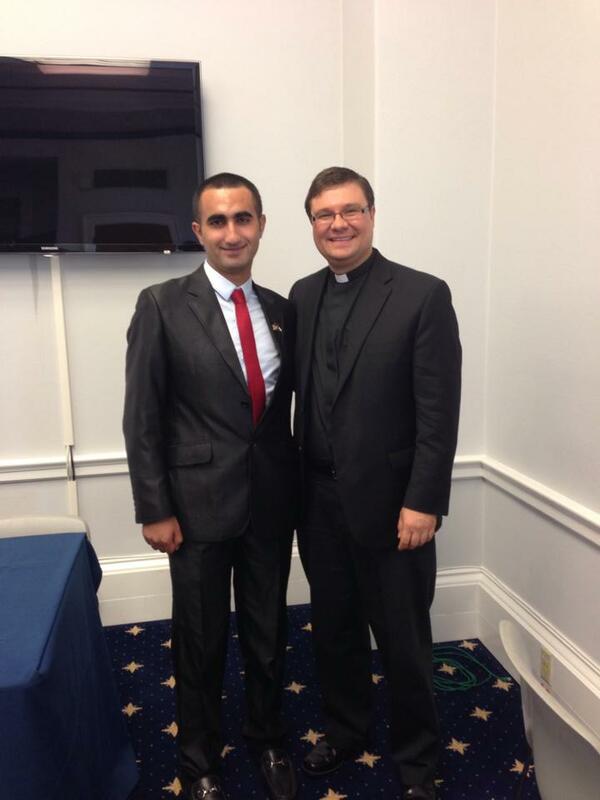 Hamze with K4P Executive Director Fr. Josh Thomas at the Congressional Forum. Trying to bring both sides to understand that both nations want peace and a better future for their children takes hard work. There are accusations of betrayal which is common against those who dare to dream and work for a shared future for both sides. Hamze Awawdeh is a Palestinian from Dura in the West Bank, near Hebron. This summer he is interning in Washington, D.C. with Americans for Peace Now, as part of the New Story Leadership program. Back home, he is an Advisor for the “Roots” (14 year-old) group of Kids4Peace Jerusalem and is active with Yala Young Leaders. “When I was 3 years old, I learned that my grandfather was a Shaheed (martyr), a man who was a freedom fighter, fighting the occupation and bravely dreaming to ensure a better life for his children and grandchildren. For many years, I had to go to his yearly anniversary event where many politicians came to talk about their memories of this man. A man who I never met because the Israeli Army took his life many years before I was born. I cannot deny that I always felt proud of him. But it was frustrating to see that his dream of having a better future for me is not yet fulfilled. Growing up in a political family, I was interested in politics in the early stages of my life. When I was 9 years old, I was nominated to represent the school in a meeting with a PLO leader. I spoke to him about the failures of the peace process, accusing him of talking to the enemies while he was supposed to be fighting them, exactly like my grandfather and his friends did. Being a student at Birzeit University in Ramallah, I was granted an independent life far from my family and town. I acquired the chance to think for myself and form my own opinions. On campus, I used to meet political activists from different backgrounds. Additionally, I started learning about the other side and I decided to talk to them. As a result, I realized the complexities of the Palestinian-Israeli conflict, which was deeper than I thought – not just all black and white as I had in my mind. I started to discover more and more of the Palestinian reality and shape it by my own understanding. I started to learn about the Israeli side trying to discover their story as well. Both nations have a valid claim to this land. Both nations believe they were victims of history. Both nations are on this land to stay. Palestinians have no other land than Palestine and Israelis have no other land than Israel. Both need to find a way to coexist. The circle of violence will continue to repeat itself until we Palestinians and Israelis break it! I learned also, that both sides do not trust each other. How could they when they are still living with walls separating them? I’m not talking about the wall that Israel built inside the west bank or the one surrounding Gaza Strip, I’m talking about the walls of the past, those walls deep in our mental and emotional consciousness which prevents us from seeing hope on the other side. How do we fix this problem? Both sides need to talk. they need to talk so they can learn and get to know each other. There is no other choice. Now I am the one who is encouraging 9 year old children to talk with other side. I’m advocating for something I was once against! In real life, it’s hard to find a common place where Israelis and Palestinians can meet and discuss the issues. Therefore, through YaLa Young Leaders the peace social movement I’m proud to be part of, we encourage the young people to use social media to talk to each other. 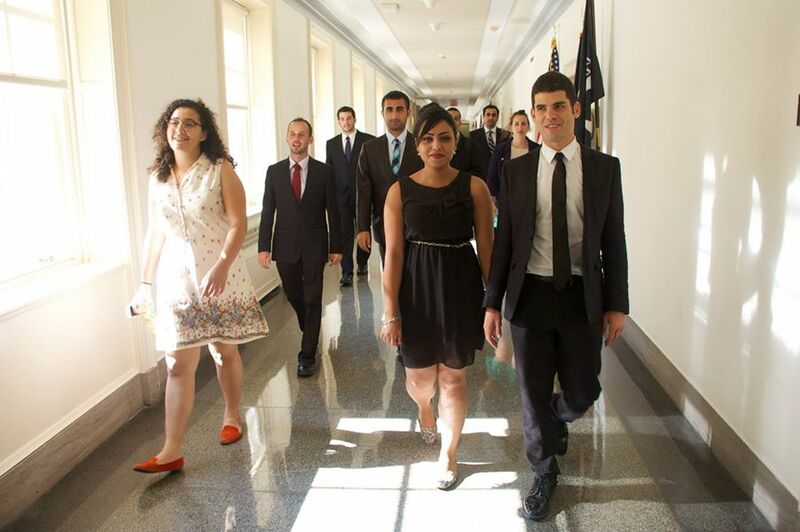 This is the advantage of having brave young leaders leading the change for peace! I remember 6 months ago, I was in Tel Aviv chatting with a friend of mine, an Israeli peace activist who with me and other peace activists (from the YaLa Young Leaders movement) initiated a peace campaign, (calling for “No More Excuses” from our leaders), for the Israeli and Palestinian people to back Secretary of State, John Kerry’s efforts to bring the parties to a peace agreement. We believed that this could be achieved by harnessing the power of the young people from both sides. My friend Yael and I were so amazed by Secretary of State John Kerry and his team’s devotion and hard work into reaching an agreement . When we realized that the peace process was not going to bear any fruit– both of us grasped the painful consequences of what that meant, and feared for another round of hostile conflict. A new common thread between Palestinians and Israeli leaders became clear to us– both Israelis and Palestinians lack leaders who care about their nation’s future. They have an interest in maintaining the status quo as it serves their political agenda. Many people on both sides have taken this reality as a given. I remember sitting with my friend Yael, sharing cigarettes, as well as our fears and anger at the lack of progress towards peace, and predicted that violent clashes between the two sides would become extremely likely. Throughout this past month in America, many people have asked me if I still have hope that Palestinians and Israelis will be able to live one day together in peace- My answer to them is always Yes!!! Today, me and my fellow participants, Israelis and Palestinians, from different sides of the fence, even as the situation back home is dire, we are here in Washington DC brave and confident enough to speak about Peace! Embodying the change we want to see in the future! Living the recognition, the understanding and the coexistence ! If this is possible now despite the bloodshed back home, then I truly believe our people can find a way to live together peacefully, and create not only sustainable relationships, but also deep friendships based on love and trust, as I have created with my fellow participant and my host brother, Yonathan. Read more about Hamze and his Israeli roommate & colleague in Haaretz.